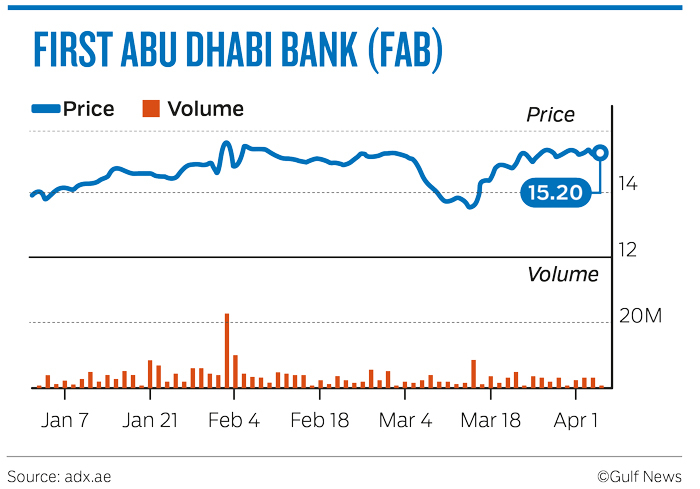 Dubai: Intense speculation over a potential merger between First Abu Dhabi Bank (FAB) and Abu Dhabi Islamic Bank (ADIB) in the past three weeks have led to a sharp jump in the share prices of both as investors eagerly wait for more banking industry consolidation. Shares of FAB have been on the rise since mid-March — gaining as much as 12.7 per cent in closing prices — while ADIB’s went up by 3.14 per cent. As of Thursday’s closing prices, FAB has risen by 12 per cent since March 14, while ADIB has been relatively flat, gaining 0.7 per cent. Analysts say that despite recent mergers and acquisitions in the marketplace, the banking sector remains over-crowded and, what’s more, fragmented. The successful merger of First Gulf Bank and National Bank of Abu Dhabi in 2017 to create FAB also helped M&A activity gain traction. But early on Thursday, both FAB and ADIB denied media reports that they may seek a merger. ADIB also said the reports were untrue, and that it is currently not studying any M&A deals with another bank. The speculation in the market over the past few weeks culminated late on Wednesday when Bloomberg reported that the Abu Dhabi government is considering merging FAB and ADIB. The report cited sources who said the deliberations are in the early stages and being discussed at a shareholder level. 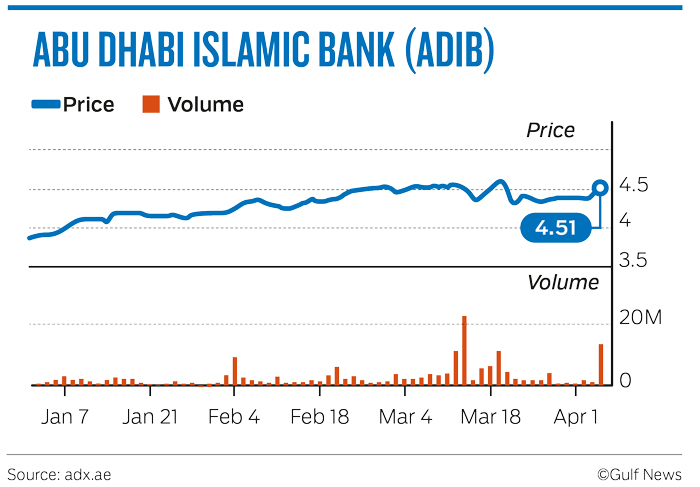 Though the two banks were quick to issue denials, ADIB’s share jumped 2.52 per cent on Thursday and was the most actively traded on the Abu Dhabi bourse by value and volume. Traders who chose to remain anonymous said that this was not the first time companies have denied merger news, only to then confirm them later. And it’s not because companies are deliberately being discreet; such talks only happen at a government or shareholder level before even being discussed within the board of directors. So there is reason to believe another merger could yet happen. Analysts shared a similar view, saying the Abu Dhabi government has a strategy of consolidation to create bigger companies that can compete better regionally and internationally. He also pointed that there is growth in demand for Islamic banking products, with opportunities especially in markets such as Saudi Arabia and Egypt. While FAB already has an Islamic banking platform, it is not as large as its conventional banking side, and a quick way to grow that would be through acquiring an Islamic bank. Sanat Sachat, portfolio manager at Al Mal Capital, said there has long been a need for consolidation in the UAE’s banking sector. This is even after the creation of FAB via a merger, and the upcoming three-way one between Abu Dhabi Commercial Bank, Union National Bank, and Al Hilal Bank. “If this happens, it will be very positive news as this will provide a strong Islamic window to FAB and better operational efficiency due to economies of scale,” he said. If FAB and ADIB are to indeed merge, they would create the Middle East’s largest lender, with assets worth $236.7 billion, making the entity even bigger than Qatar National Bank, which now has $235.9 billion in assets, as per data from Bloomberg.